ATD’s 2019 TechKnowledge Conference is less than a month away and Float could not be more excited. From February 6-8, in West Palm Beach, Florida, there will be 125+ sessions, over 15,000 attendees and 70+ exhibitors — including Float. We are also excited to be a part of ATD’s TechKnowledge 20th anniversary. It’s no secret we believe Artificial Intelligence is the new wave of the future. Some benefits of AI include reduced costs and boosted efficiency within the workplace. Here are three sessions Float is excited about. Chief Scientist and Vice President for DDI’s Center for Analytics & Behavioral Research, Evan Sinar, will speak to attendees on the blending of both human and artificial intelligence (AI) into a single learning experience. You will be given a demonstration of how AI can help develop skills for interviewing and create a personalized virtual environment for learning. Lee Collier, the Senior Account Executive at doceboⓇ, will aim to uncover the various ways learning-specific artificial intelligence produces immersive learning experiences. You will also learn how AI is being used in the learning technology world to help L&D teams. In Amazon’s Technical Instructional Designer Almira Roland’s session, you will learn how to develop an Alexa skill with no coding skills required. Discover the core concepts of voice user interface (VUI) terminology, brainstorm learning experience use cases for a VUI, and develop an Alexa VUI skill prototype of your own. Mursion’s Marketing Team, Specialist Anna Strasshofer, and VP, Christina Yu, will be providing VR training. Mursion will look at research in learning science, AI, and psychology to find the best technology and human interaction. In this session, by Qatar VP of Talent Development, Brendan Noonan, and Senior Manager, Innovation and Digital Learning, Himanshu Joshi, you will learn how to introduce and sell virtual reality (VR) training to your organization. In Rockwell Collins’ Multimedia Learning Specialist, Destery Hildenbrand’s session, you will discover how easy it is to get started using augmented reality (AR) in learning development. Get your hands dirty creating an AR experience, and test other examples of AR projects. President of eLearningJoe, LLC, Joseph Ganci, and CFO of Learningtogo.info, Margie Meacham, focus on the integration of chatbots in daily tasks. Learn how these intelligent chatbots can adapt to the needs of learners, share tips, suggestions, and answer the questions. Alexander Salas, the Digital Learning Designer for Dell Technologies, we teach you how chatbots are used in customer service to answer questions. Learn the skills and knowledge needed to build your own Q&A chatbot without any programming knowledge. TH11010HOL- Hands-On Machine Learning: Lost in a Random Forest with Pandas! Zsolt Olah, the Learning Consultant for Kineo, will be informing his audience about how Machine Learning, a subset of artificial intelligence, is changing how we work, live, and get things done. You’ll walk step-by-step through writing your first lines of code in Python and learn to analyze data and predict future housing prices. Explore mLearning by building your first model. Discover the power behind ready-to-use libraries to support your mLearning models. Join Erika Moreee, AVP of training and development at Synchrony, a consumer financial services company, as she shares her experience in applying gamification and the use of microlearning in the field. TH202- Effective Microlearning: A Showcase of Examples and 10 Tips for How You Can Do It Too! Director of Instructional Design for Bull City Learning, Inc, and Owner/Lead Instructional Strategist for Torgerson Consulting, Carla Torgerson, will give 10 recommendations for designing effective microlearning resources. 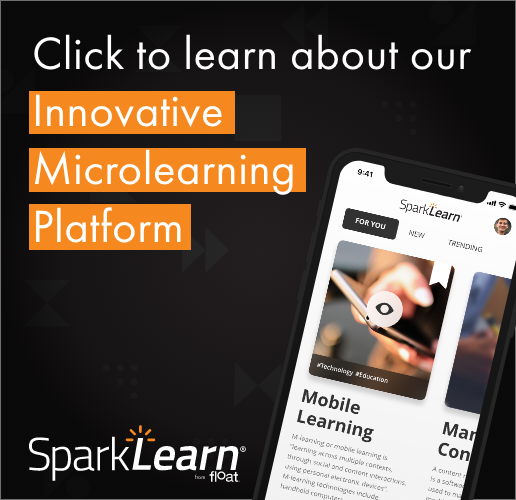 You will learn best practices for creating your own microlearning resources and how to incorporate microlearning within your organization. Float is beyond excited for one of the keynote speakers, Dean Kamen. Kamen is an American inventor, the originator of the Segway, a pump to administer the precise dose of medication to patients, the HomeChoice portable dialysis machine, and more. We are looking forward to learning from a man who constantly seems to make the impossible possible. In Dean’s session, you will hear about his endless ideas and his jaw-dropping innovations using new and emerging technologies. Kamen is a figure who has done so much to better our world through his inventions, specifically in the healthcare industry. You don’t want to miss out on this opportunity to see him speak. So now that you have seen several of the sessions we are excited about, you’re probably wondering what to you can expect from Float. Good news! We are delighted to announce that our Managing Director, Chad Udell will be speaking on a very exciting panel. Float’s own Chad Udell, alongside Jennifer Murphy, CEO, and founder of Quantum Improvements Consulting, will be discussing AI, AR, VR, chatbots, predictive analytics, and more tech trends. This session will study the realities and challenges of adopting new technology, and give a forum to test and assess what will work for your business. So what sessions are you looking forward to the most? Will you be attending the 20th ATD TechKnowledge Conference? If you have any questions, or you would like to drop by and say hello, you can find Float at Booth 802. Thanks for sharing this information with us. It is really good to know about the AI Sessions, Machine Learning Session. Keep Posting.